Many of the most popular websites on the web have been participating in a historic Internet-Wide Day of Action to Save Net Neutrality today to oppose the FCC’s plan to slash Title II, the legal foundation for net neutrality rules that protect online free speech and innovation. A flood of major web platforms like Twitter, Reddit, Netflix, Spotify, 4chan, Airbnb, Amazon, Mozilla, OK Cupid, Vimeo, Tinder, Expedia, Pornhub, Imgur, Yelp, and Soundcloud displayed prominent protest messages to their users, encouraging them to take action by contacting the FCC and Congress through tools like BattleForTheNet.com that make it easy for Internet users to make their voices heard. Celebrities flocked to support the effort including Pearl Jam, Wil Wheaton, Tim Robbins, Susan Sarandon, Blues Traveler, Steven Fry, Mark Ruffalo, Laura Jane Grace, Kendrick Sampson, Amanda Palmer, Ted Leo, Samantha Bee, and many more. Broad participation from every corner of the Internet: from online gaming communities to librarians to real estate sites to grassroots organizations to independent musicians. NOTE: The volume of participation was so high that the FCC has been “rate limiting” submissions into their docket – there are an enormous number of comments queued up that will be submitted into their system before the July 17 deadline, as fast as their system can handle them. The same is true for emails to Congress members, which will be delivered in the days to come. “Today is a historic moment when the Internet is realizing it’s power—with massive amounts of creative activism spreading to every corner of the Internet, from the smallest and weirdest nooks and crannies of the web to the most popular websites on earth. And this doesn’t end today—this protest is the kickoff of a sustained campaign to keep the pressure on lawmakers and the FCC to do the right thing. This is just our opening salvo, and it’s a massive one. “The FCC needs to listen to the public, not just lobbyists from big cable companies. No one wants companies like Comcast, AT&T, and Verizon to have control over what we can see and do online, or to have to pay them extra fees to access the content we want. The Internet is outraged by censorship and corruption, this is our moment to to defend net neutrality and fight for the future of freedom of expression. “Today, the largest web platforms in the world, scrappy activist organizations, and individuals from across the political spectrum came together online and in-person to make their voices heard. “Americans took to the internet to stand up for the rights to communicate freely, to organize, and to innovate online. Ajit Pai’s plan to undermine net neutrality and stifle online speech would endanger these ways we use the internet, and could even make it harder – or impossible – to organize protests like today’s. 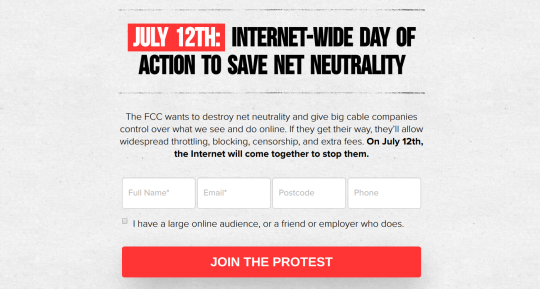 “People used the internet to save the internet today. That’s because the Trump FCC’s push to ​destroy​ ​Net Neutrality's​ ​legal foundation​ ​isn’t fooling anyone​. “We know that the open internet is critical for marginalized communities that ​​corporate media have misrepresented; that it’s essential for free speech and political organizing online; and that tech entrepreneurs need an open network to survive just as much as working families​ do​.